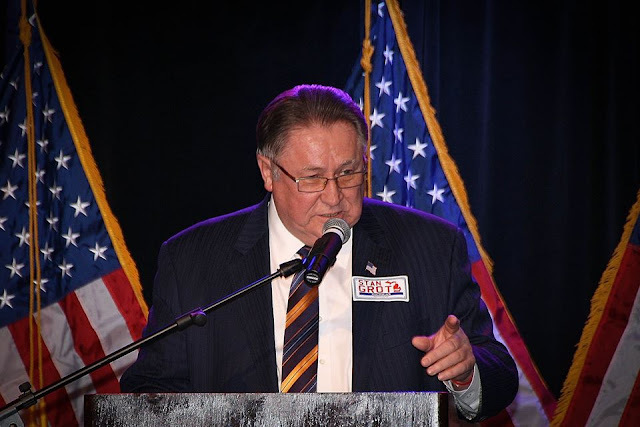 Speaker Tom Leonard raised nearly $400,000 for his Attorney General campaign in the last few months, giving him over $566,000 on hand as the campaign to replace Bill Schuette heats up. Leonard touted his new numbers-as well as his grassroots support- in a press release Wednesday afternoon. He says his campaign has what it takes to win in November. "I have been overwhelmed with the encouragement and support we have received since this campaign began just a few short months ago," Leonard said. "Our message of a safer, stronger Michigan is resonating across the state. We are undefeated in straw polls of grassroots activists, and we have received far more fundraising support than any other candidate in the race. We have the momentum, and we are ready to win in November." His opponent, State Senator Tonya Schuitmaker, brought in a little over $60,000, bringing her total cash on hand to over $281,000, about half of Leonard's war chest. Both candidates spent around $30,000 in the last few months, reports show. At this point, Leonard is clearly the stronger candidate for the general election in November, and this report solidifies that fact. Winning will take money, and Leonard is proving he can raise the necessary funds to get his message out and compete all across the Great Lakes State this fall. Leonard and Schuitmaker recently sparred over the controversial "Common Core" law in Michigan. Schuitmaker helped implement Common Core in 2013, but has since changed her position and now opposes it. Responding to a recent video on the subject from Leonard, Schuitmaker says she is upset he has not held a vote to repeal in the House. Leonard still has nearly a year to hold that vote, though. Republican delegates to the state convention in August will decide the Republican nominee for Attorney General, as well as Secretary of State, Lt. Governor, and Trustees for U of M, Wayne State, and MSU. 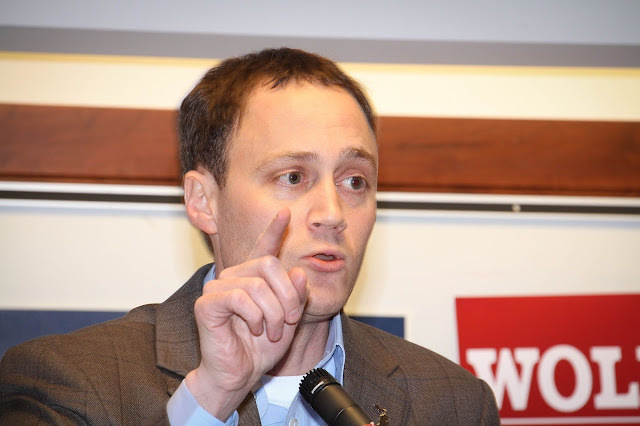 A controversial proposal from Attorney General Bill Schuette would strip the power of Republican Precinct Delegates to choose the party's nominees for Board of Trustees at the University of Michigan, MSU, and Wayne State at the state convention. The proposal also removes the power of voters to choose Trustees at the ballot box in November. Instead, Schuette believes that the Governor should get to handpick university leaders. "Attorney General Bill Schuette called for a constitutional change in the governance of Michigan's flagship universities Monday as he stepped up scrutiny of Michigan State University and what top school leaders knew about complaints lodged against disgraced sports medicine doctor Larry Nassar. Schuette, acting in his campaign for governor, said the governing boards of MSU, the University of Michigan and Wayne State University should be gubernatorial appointees like the 10 boards that govern the state's other public universities. The members of MSU, UM and Wayne State's governing boards are nominated by political parties and elected in statewide races to eight-year terms." Stripping grassroots delegates and voters of their power to choose who leads Michigan's most prominent universities is a terrible idea. Further politicizing these important boards with a Gubernatorial appointment process is not needed for any reason. Campaign donors shouldn't be rewarded with plum positions like these, candidates should have to go in the trenches, answer tough questions, and make their case to Michiganders. Schuette's proposal misses the mark-big league. 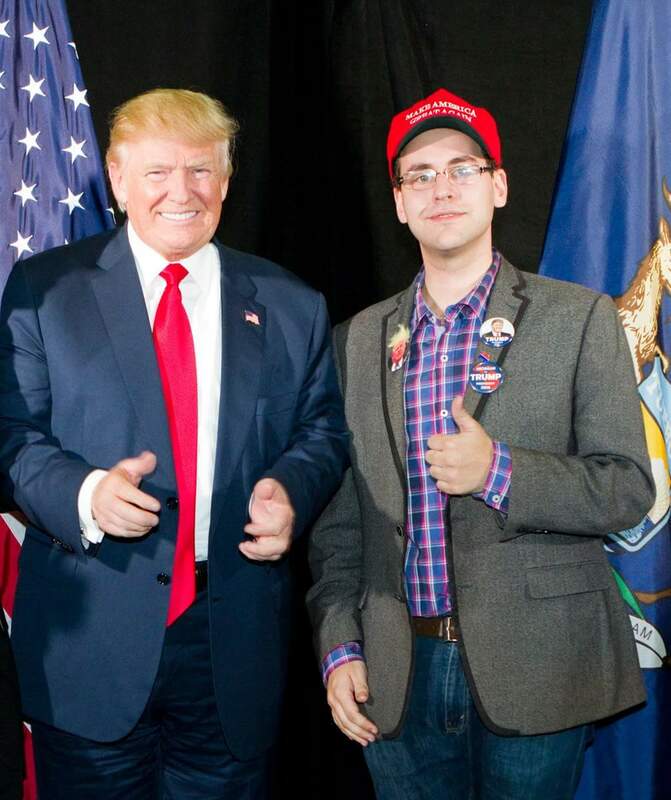 Matt Hall, a Michigan Republican State Committeeman from Grand Rapids who is a strong supporter of President Trump, is challenging Rep. Justin Amash in the August primary. Hall filed his campaign paperwork with the FEC earlier this year and is expected to officially announce his campaign in the coming weeks. Hall served as a Trump delegate to the RNC in Cleveland last year, and he was also a member of the Rules Committee, helping to end the "Never Trump" movement with a vote he led. 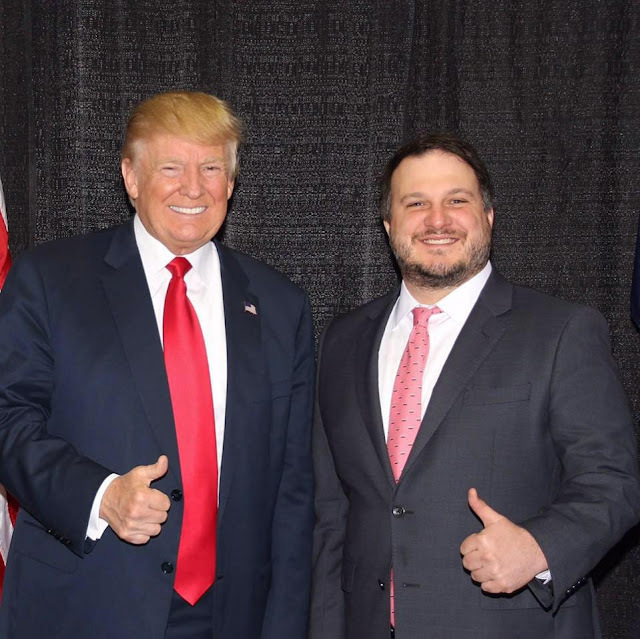 Hall, who recently graduated from law school, also served as the 3rd Congressional District Chair for President Trump's 2016 Michigan campaign. 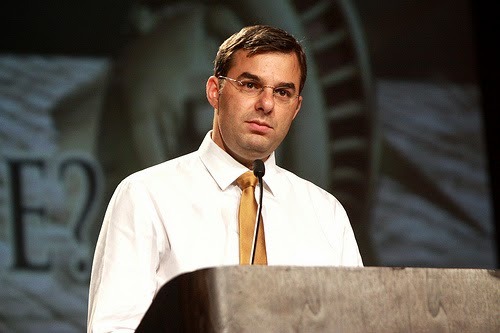 "Hall said he supported Amash in his 2014 primary race against Brian ELLIS, but now feels that with the congressman's attacks against President Donald TRUMP he has moved too far from the Republican Party. "I believe Justin Amash needs to be held accountable to the grassroots of the Michigan Republican Party," Hall said. "The guy is not in line with the Republican base and someone needs to hold him accountable . . . He claims to be a constitutional conservative. I intend to expose him as a fraud." Hall was a field director for former Secretary of State Terri Lynn LAND and a constituent relations liaison for Attorney General Bill SCHUETTE for four years before going to law school and externing at the Michigan Administrative Hearing system. "I support building a wall. I support the travel ban. I don't support bad trade deals. I oppose chain migration," said Hall, who said he plans on running for Congress "full time." "Someone has to hold this guy accountable for not being a Republican and not supporting President Trump's agenda." A blockbuster new report from Bridge Magazine shows that Democrat Abdul El-Sayed, a Doctor from Detroit who is running for Governor, may be ineligible for the 2018 ballot. 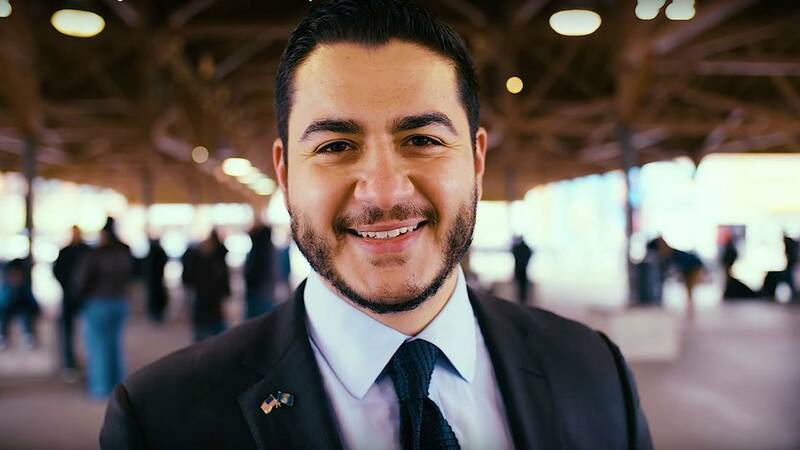 The controversy surrounds El Sayed's 2015 voter registration in New York City, as the Michigan Constitution requires one be a registered voter in the Great Lakes State for at least 4 years before running for Governor. "To be eligible for the office of governor or lieutenant governor a person must have attained the age of 30 years, and have been a registered elector in this state for four years next preceding his election," says Article 5, Section 22. El Sayed has raised significant money from outside the state in his quest to become the first Muslim Governor in America. "Dr. Abdul El-Sayed’s life story is a cornerstone of the Democrat’s campaign for Michigan governor. Born in Metro Detroit, he starred in high school sports, won a full scholarship to the University of Michigan Medical School and became chief of Detroit’s Health Department at age 30. That’s because the Michigan Constitution requires gubernatorial candidates be a “registered elector in this state” for four years before the general election – and El-Sayed was registered to vote in Manhattan as recently as March 2015, New York Department of Elections records show. “This may be a problem. This may be something that the courts may have to decide,” said Ed Sarpolus, executive director of the Target-Insyght polling firm in Lansing. El-Sayed’s campaign told Bridge he’s eligible because he has owned an apartment in Ann Arbor with his wife since 2008." Attorney General Bill Schuette made a surprise appearance in Grand Rapids at the first debate between the Republican candidates running for Governor Monday night, a cardboard cutout version, at least. 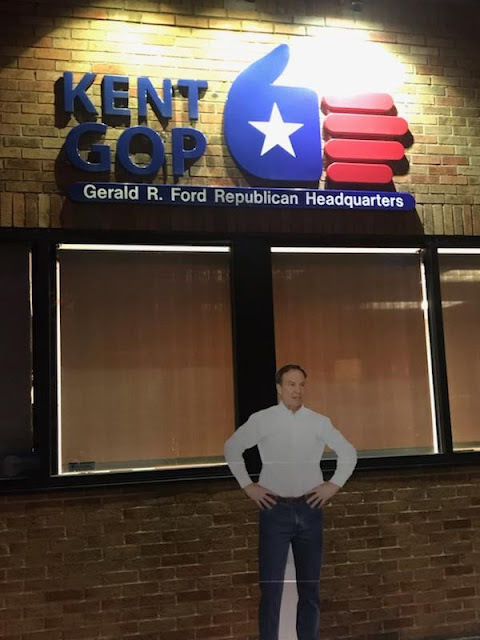 The stand up was visible outside Kent GOP headquarters, and WMP snapped a pic. Schuette refuses to participate in a series of townhalls with the other candidates. 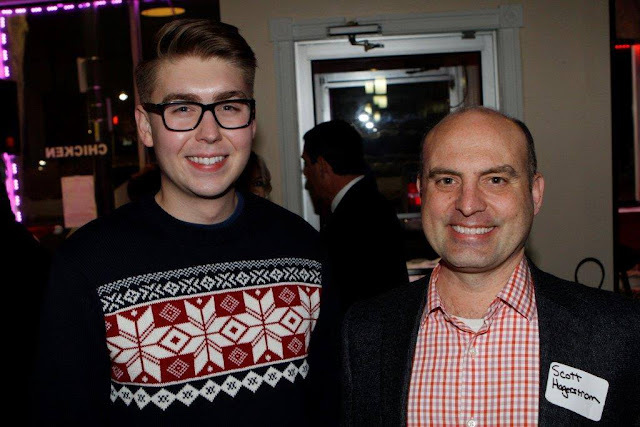 Monday's event was hosted by the Kent County Republican Party in Grand Rapids, and it was a packed house of Kent GOP members, local politicians and candidates, as well as many Republican activists. The next debate is Wednesday in Jackson, and Schuette says he will not attend that, either. The debate is hosted by the Jackson Chamber of Commerce. It's not clear how long Schuette will avoid debates, eventually, he will need to face Republican primary voters. Kudos to Dr. Jim Hines, Lt. Governor Brian Calley, and State Senator Patrick Colbeck for attending tonight's event! Developing: Will Speaker Leonard Impeach The Michigan State Board Of Trustees? As controversy rages at Michigan State University over the sexual assault scandal involving Dr. Larry Nassar, the spotlight is now on the MSU Board of Trustees after President Lou Anna K. Simon and Athletic Director Mark Hollis resigned late last week. While Governor Snyder has the authority to remove the trustees, many believe the Governor is reluctant to use that power for a myriad of reasons. His office says he is considering doing something, but what that means is unclear. Enter House Speaker Tom Leonard. Leonard passed a resolution from State Rep. Tom Barrett last Thursday in the House that was extremely critical of MSU leadership, and subsequently, Simon and Hollis were gone within hours. In media interviews about the controversy, Leonard has raised the possibility that the Trustees could be impeached by the House. "Speaker of the House Tom Leonard, R-DeWitt Township, said while the resolution dealt solely with Simon, he'd like to see the entire board resign or be impeached by the Legislature. "I do believe the board of trustees needs to resign. I've never seen a situation that's been this mishandled," he said. "These trustees care more about their skyboxes in the fall than these 150 victims. And that's absolutely reprehensible." "The house of representatives shall have the sole power of impeaching civil officers for corrupt conduct in office or for crimes or misdemeanors, but a majority of the members elected thereto and serving therein shall be necessary to direct an impeachment. When an impeachment is directed, the house of representatives shall elect three of its members to prosecute the impeachment. Every impeachment shall be tried by the senate immediately after the final adjournment of the legislature. The senators shall take an oath or affirmation truly and impartially to try and determine the impeachment according to the evidence. When the governor or lieutenant governor is tried, the chief justice of the supreme court shall preside. No person shall be convicted without the concurrence of two-thirds of the senators elected and serving. Judgment in case of conviction shall not extend further than removal from office, but the person convicted shall be liable to punishment according to law." Who might Leonard appoint to prosecute the impeachment if he moves forward? State Rep. Jim Runestad and State Rep. Laura Cox seem like a great place to start, and Leonard gets to choose three... Perhaps State Rep. Tom Barrett as well? State Senator Patrick Colbeck is the first major candidate for Governor to turn in nominating petitions to the Secretary of State. Colbeck turned in around 18,000 signatures earlier this week, 3,000 more than needed. Once confirmed, Colbeck will now be on the August 2018 Republican primary ballot. Dr. Jim Hines turned in his signatures last year. Colbeck touts the grassroots effort behind the process. No paid signature gatherers were hired, hundreds of his supporters got the job done on their own. "Over 500 volunteers sacrificed countless hours to make this possible," Colbeck said in a Facebook statement. "Unlike other gubernatorial campaigns, no one was paid to collect signatures nor did we spend money on expensive mailers to registered voters nor did we use taxpayer funded staff to collect signatures. It was a pure grassroots effort that differentiates the enthusiasm of our supporters from those of the other campaigns. It also shows how we do more with less financial resources...which is a good skill set for our next Governor." Colbeck will face off against Lt. Governor Brian Calley at a town hall in Grand Rapids on January 29th. Attorney General Schuette refuses to participate. 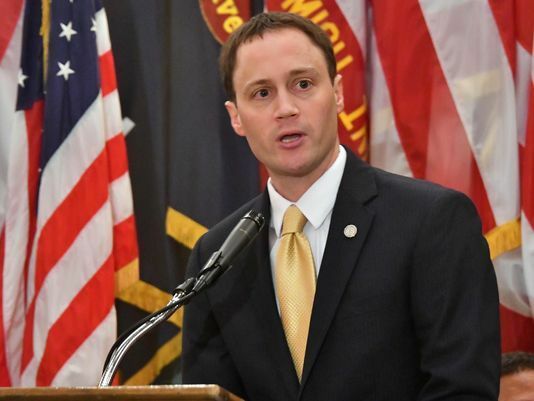 Scott Hagerstrom has resigned as the Michigan Republican Party Deputy Chair in order to take a leading role with "Better Jobs, Stronger Families," the Political Action Committee supporting Bill Schuette's campaign for Governor. 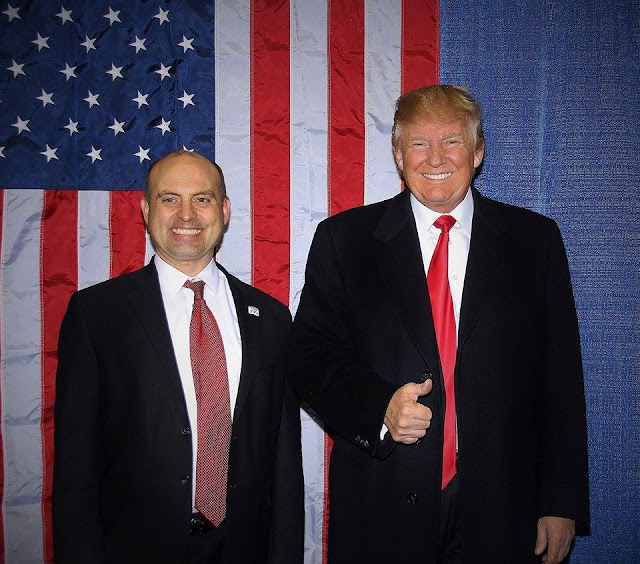 Hagerstrom led President Trump's historic Michigan campaign in 2016. Before that, he worked with Paul Mitchell to defeat Prop 1. Hagerstrom also spent years leading American For Prosperity's political efforts in the Great Lakes State, notably, the fight for Right To Work. Hagerstrom praised Schuette and says he is excited to work with the grassroots to deliver a win for the AG later this year. Political consultant Stu Sandler is the Executive Director of the PAC. Sandler says Hagerstrom's addition to the team is exciting, and that he will be critical to winning in November. “We are excited to have Scott join our efforts to support Bill Schuette. Scott will generate grassroots excitement and momentum around Bill Schuette’s vision for a stronger Michigan,”Sandler said in a press release. “Scott has the talent, passion and drive to help build the type of grassroots movement that will be critical to our victory in November." Speaker of the Michigan House Tom Leonard is renewing his push against Common Core in a new video campaign as the issue continues to remain a problem with his opponent in the Attorney General race, State Senator Tonya Schuitmaker. Leonard says in his new video that he supports the 10th Amendment when it comes to education policy, the feds should stay out. Leonard also says that Michigan families "deserve better than Washington's broken policies"
In a statement coinciding with the release of the video, Leonard says that the government needs to let teachers do their job, not make things harder. "Quality education for Michigan’s next generation should always be a top priority," Leonard said. "I’ve met some phenomenal teachers when I was a student and now as a state representative. They work hard each day to prepare students for life outside the classroom, bringing their own ideas, knowledge and life experience to the table. But we need to make sure we’re not making their job more difficult. Too often, government has interfered with the learning going on inside the classroom. I am the only attorney general candidate who has fought against common core since day one. Foundational issues like local control and parental choice have been critical concerns of mine from the beginning, not just when they became politically expedient. While standardized testing is critical to evaluating our students, we need to give schools and teachers the time and autonomy to provide our children with a quality education." Conservatives praised Leonard's video, and many hope he will hold a vote to try and repeal Common Core. "Glad to see someone still willing to fight against Common Core State Standards," said Allegan County Clerk Bob Genetski. "The federal government cannot be trusted with deciding what our children learn local schools. Thank you Tom Leonard." Schuitmaker's past support of Common Core could prove to be a major issue for conservative grassroots delegates as they decide who to vote for in the Attorney General's race. Schuitmaker voted for Common Core in the State Senate in 2013. 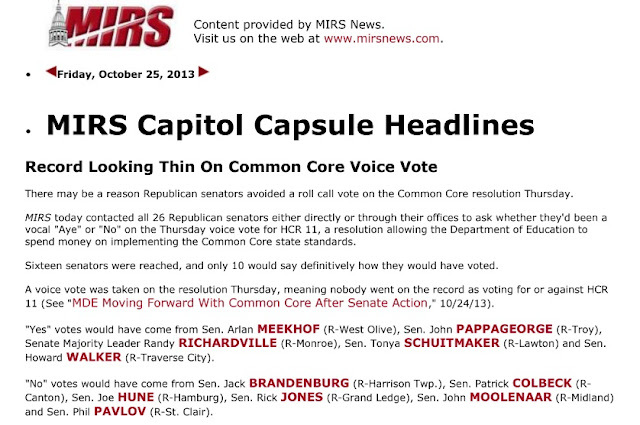 "There may be a reason Republican senators avoided a roll call vote on the Common Core resolution Thursday. MIRS today contacted all 26 Republican senators either directly or through their offices to ask whether they'd been a vocal "Aye" or "No" on the Thursday voice vote for HCR 11, a resolution allowing the Department of Education to spend money on implementing the Common Core state standards. Sixteen senators were reached, and only 10 would say definitively how they would have voted. A voice vote was taken on the resolution Thursday, meaning nobody went on the record as voting for or against HCR11. " Yes" votes would have come from Sen. Arlan MEEKHOF (R-West Olive), Sen. John PAPPAGEORGE (R-Troy), Senate Majority Leader Randy RICHARDVILLE (R-Monroe), Sen. Tonya SCHUITMAKER (R-Lawton) and Sen. Howard WALKER (R-Traverse City). "No" votes would have come from Sen. Jack BRANDENBURG (R-Harrison Twp. ), Sen. Patrick COLBECK (R-Canton), Sen. Joe HUNE (R-Hamburg), Sen. Rick JONES (R-Grand Ledge), Sen. John MOOLENAAR (R-Midland) and Sen. Phil PAVLOV (R-St. Clair)." Stan Grot, the Shelby Township Clerk and 10th Congressional District Republican Chair running for Secretary of State, says it's time for that office to take over Detroit's controversial election system. Detroit has seen two immensely problematic elections in recent years, with many ballots being unable to be recounted after the 2016 Presidential election, as well as after local elections in 2017. Grot says the final results are questionable, and the problems are hurting the confidence Detroiters have in the system. “Recently, the Detroit City Clerk has come under scrutiny for yet another botched election, Grot said in a press release. "Tainted ballots prevented a legitimate recount from taking place in her own re-election bid in November. Her abysmal track record is proof that she is incapable of conducting fair elections.It’s still unclear whether the errors are a result of deliberate manipulations or incompetence, but one thing we know for certain is that it has compromised the integrity of our elections in Detroit. It’s caused many Detroit voters to lose interest in the process entirely, threatening the very foundation our democratic system is built on. This is very unfortunate with so many important decisions on the 2018 ballot for Michiganders to make." Grot says it's time for action. Grot faces MSU Professor Dr. Joseph Guzman and Eastern Michigan University Trustee Mary Trader Lang in the battle for the Republican nomination for Secretary of State. Delegates will decide who gets the nod at the Michigan Republican Party State Convention in August. 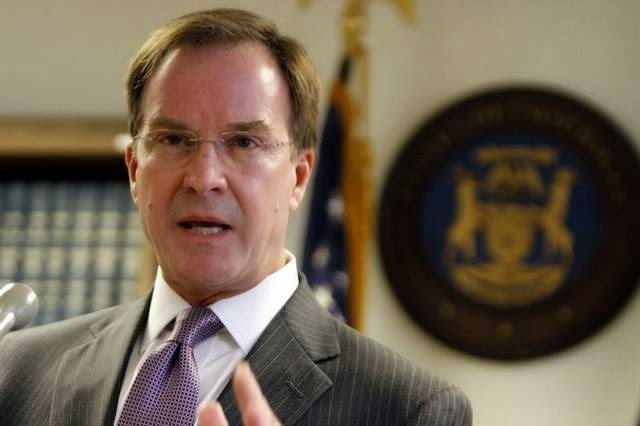 Attorney General Bill Schuette is demanding a retraction from the Detroit News after the paper claimed in an editorial that the Attorney General is not interested in the truth about what happened at Michigan State University during the Larry Nassar scandal. The Detroit News says Schuette seems uninterested in getting to the bottom of things, and that he must do the job he currently has before moving on to Governor. "The News’ reporting identified 14 MSU staffers who in some fashion were made aware of the girls’ complaints, but either did not act, or acted instead to protect Nassar. Schuette, who is running for governor, must step beyond any political calculations and do his job before he can make a legitimate claim to the next one he seeks." After the MSU Board of Trustees met today to ask the AG's office to investigate the University, Schuette addressed the paper, calling for them to retract their claims. "A full and complete review, report and recommendation of what occurred at Michigan State University is required and I will provide that," Schuette said in a statement. "However, this week and the coming weeks are time for the survivors of Larry Nassar to have their day in court, and I refuse to upstage their time for healing. 4. Asking for a full report from Michigan State University, which I was told didn't exist. The Detroit News in an editorial today called me wrong and indifferent, nothing could be further from the truth, and they should issue a retraction." 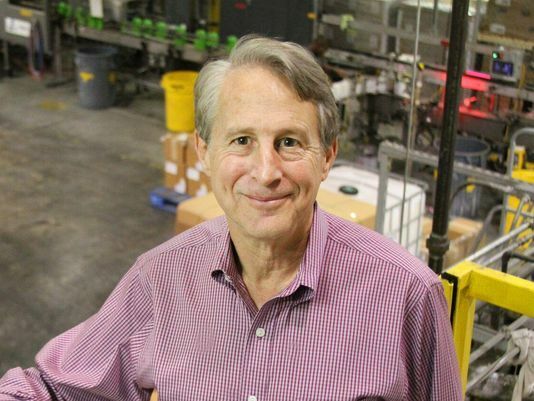 Biz wiz Sandy Pensler is serious about beating Debbie Stabenow, and now the Republican Senate candidate is giving his campaign $5 million to get the job done. Pensler spokesman Tom Shields says the move shows Pensler is serious. "Republicans now have an impressive candidate with real business experience and the resources to hold Debbie Stabenow accountable for her four decades of double talk as a career politician,” Shields said in a press release. Pensler's announcement comes just days after former Michigan Supreme Court Chief Justice Bob Young dropped out of the race after struggling to raise money. Young only had $100,000 on hand while Stabenow sits on $7 million. Speculation has also swirled regarding John James dropping out of the race. James, a Veteran, West Point grad, and businessman, has inspired Republicans with a powerful story, but that story has failed to produce support in the polls, or improve his fundraising. James had about $200,000 on hand in his last statement and struggles to crack double digits in polling. Pensler, a business turn around artist from Southeast Michigan, helps companies on the brink of failure, saving jobs and making a profit in the process. Lt. Governor Brian Calley has proposed a series of town hall meetings for Republican primary voters to ask candidates for Governor questions, six in six weeks. State Senator Patrick Colbeck and Dr. Jim Hines have accepted Calley's invitation, but Attorney General Bill Schuette is refusing, apparently unwilling to take his case directly to the voters. Schuette says he will participate in townhalls at another time, to be determined. "Lt. Gov. Brian Calley is challenging his Republican primary opponents in the governor's race to travel the state with him over the next month and a half, participating in six town-hall style debates. "The next state election will determine whether Michigan continues its comeback or goes in a different direction, so Michigan Republican primary voters deserve the opportunity to ask all the GOP candidates for governor questions about their visions for the future of our state," Calley said in a press release. "That's why I'm calling on all the candidates seeking the GOP nomination to commit with me to participating in a series of candidate town hall events throughout Michigan over a period of six weeks." Attorney General Bill Schuette, a big hitter in the Republican gubernatorial field, does not plan to participate, according to spokeswoman Katie Hills. "Bill believes they should be at work trying to cut taxes. We are looking forward to things like town halls at a later time," Hills said. But other gubernatorial candidates are primed for the challenge. 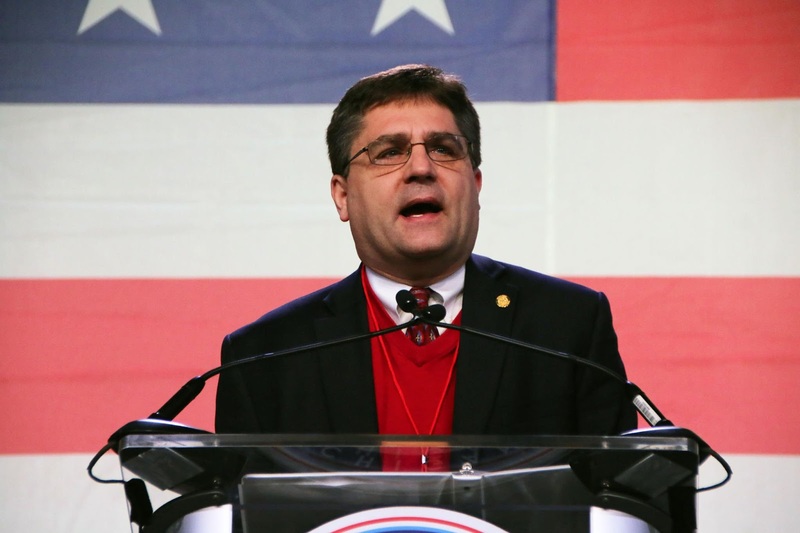 Sen. Patrick Colbeck, on WJR's Frank Beckmann show Monday, said he, Jim Hines and Calley had agreed to the series of town halls. "We've all agreed on a suite of town halls that we're going to have, sharing our respective visions for where we want to take Michigan," Colbeck said. Hines is open to participating in the debates, a member of his campaign staff confirmed." The decision comes as Schuette has been in the hot seat for threatening to fire state employees who did not support his Gubernatorial campaign.